Well, both kids have adjusted very well to the new braces they got at Orthotic Solutions just over a week ago. Sometimes it can take up to 2 weeks to get to a “full time” 22 hour per day schedule, but my son is already wearing his nearly full time. He’s been wearing it to school all week and I actually have to MAKE him take it off when he gets home to give his body the required and necessary resting period. My daughter is also very comfortable. We didn’t even need to give her one dose of Motrin this time. I feel incredibly blessed and thankful to God that they are both so comfortable in and accepting of their braces. But, it’s also a testament to a well-made brace and comfortable undergarments. Next week I plan to feature many of the new products that I’ve been developing over the past many months – as our journey has continued into new realms (boy bodysuits), and patients have been making requests. Please come back next week for some photos and explanations of all the new products we have to offer. Until then, enjoy the chaos – I know we will! As for my daughter, she was an old pro – she immediately pointed out all the places where the brace irritated her, so Luke could make quick revisions. She was MUCH less sore this time than the last couple times, and he was very impressed by her improved posture. I want to remind parents that just because the cobb angle says one thing, does not mean it represents the entire picture of how your child is reacting to the brace. My daughter’s Cobb angle has held steady (although it was pushed back quite a bit by the Cheneau), but her rotation is much improved. That is something difficult to measure, but more through general observations. It still took about 5 hours total for each child over the three days, but Luke is a perfectionist, and it shows. He’s trying out a silicone pad for her hip, where she just recently got a very large sore from the brace pressing against her hip. It didn’t really bother her until it got very big. And, she was due for a new brace because of her growth, but it’s healing now, and the silicone pad is giving another layer of protection against the brace. All in all, it was a great visit – tiring and stressful at times, but we made the best of it. Mission accomplished. 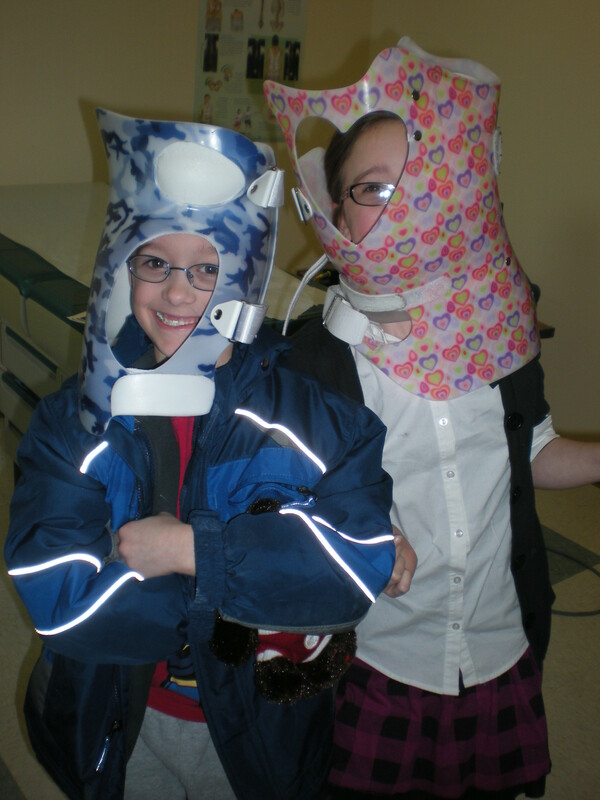 My son and daughter goofing around with their new braces - this was another of my son's ideas about a good use for the brace! I am very excited to be one of the FIRST to write about the amazing new Tornado Suit. 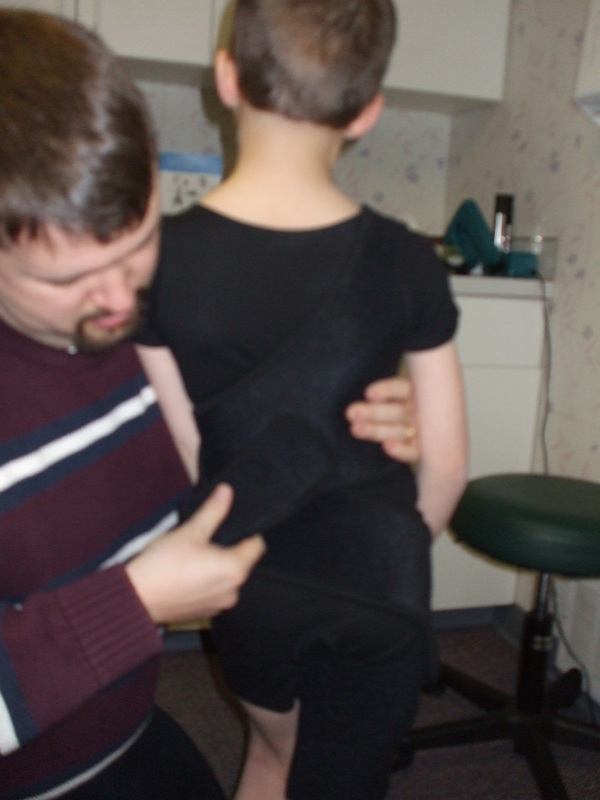 Invented by Dr. Mark Morningstar of the Natural Wellness and Pain Relief Centers of Michigan, this suit is the newest bracing option and my son was the first test case to be put into the suit. As I write this, Dr. Morningstar is scheduling interviews with the top medical journals to discuss this product, but he has given me the go-ahead to blog about it. He is currently in the testing phase and he has several patients waiting for fittings. The suit is available very inexpensively through this initial testing phase, so give them a call – I have a link to their website in my sidebar under “Favorite sites”. And, because I support this endeavor, each person to be fitted (for a VERY limited time), will receive a FREE EmBraced In Comfort bodysuit with their Tornado Suit – to maximize the comfort and effectivity of the brace. But, let’s get to the nitty gritty about this suit – made of perforated neoprene, this suit is the most comfortable yet to be on the market. It’s a flexible system (like the Spinecor), but what makes it unique is that it doesn’t use the pelvis as an anchor. 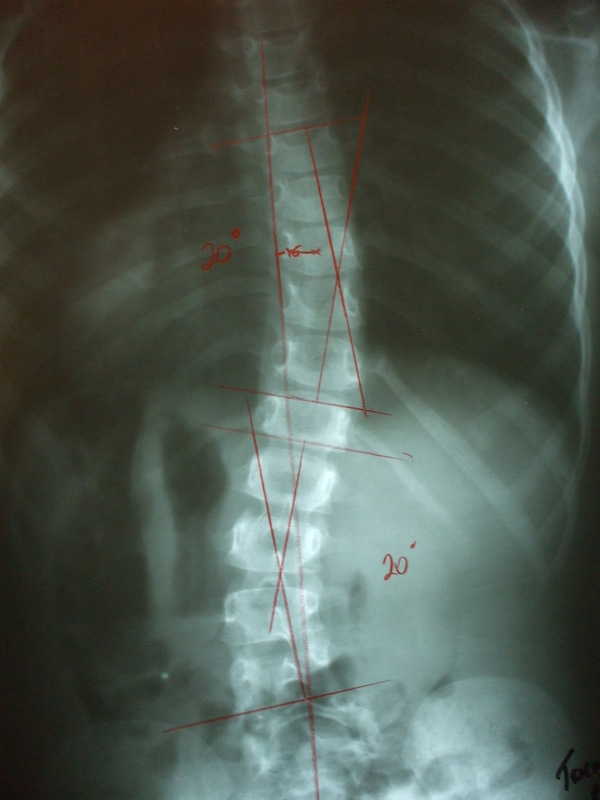 Many people with Scoliosis have uneven pelvises, so a system that anchors there may be less than effective. The Tornado Suit uses the LEG to anchor, which is the only part of a person that is usually even and stable. This suit works hand-in-hand with the Pettibon system of weights and works to correct both the rotational and horizontal rotation/curvature of the spine (similar to Spinecor and the Cheneau). Minutes after being fitted (and, my son, at 7 was VERY excited to be fitted – after all, what little boy would not want a TORNADO suit? He thought it would protect him from tornadoes, but was just as excited after finding out that it was not the case). Anyway, minutes after being fitted, he was running, jumping, rolling around – all the things that little boys like to do. And, it stayed in place, did not ride up or shift, and when he needed to run to use the restroom, he was able to go quickly and without taking off any components because of the bodysuit underneath. He’s wearing it to school for the first time today, so I can tell you more how THAT goes, but let me show you the x-rays so you can see the effect. While in the Tornado suit - 20 and 20 degrees! And, the sideways shift decreased 3 degrees. As you can see, we got about 8 and 3 degrees correction, with a correction in the overall sideways shift of the spine (keeping him more centered with the pelvis and feet). And, the best part is that Dr. Morningstar did not put it on very tight! Over time, as he gets used to it, we can slowly tighten it until we get better correction. So, if you’d like to be a part of this groundbreaking new system, contact Dr. Morningstar – he is working with several doctors across the country, so there may be someone close to you that you can get fitted by, or, just take a trip to beautiful, snowy Michigan. 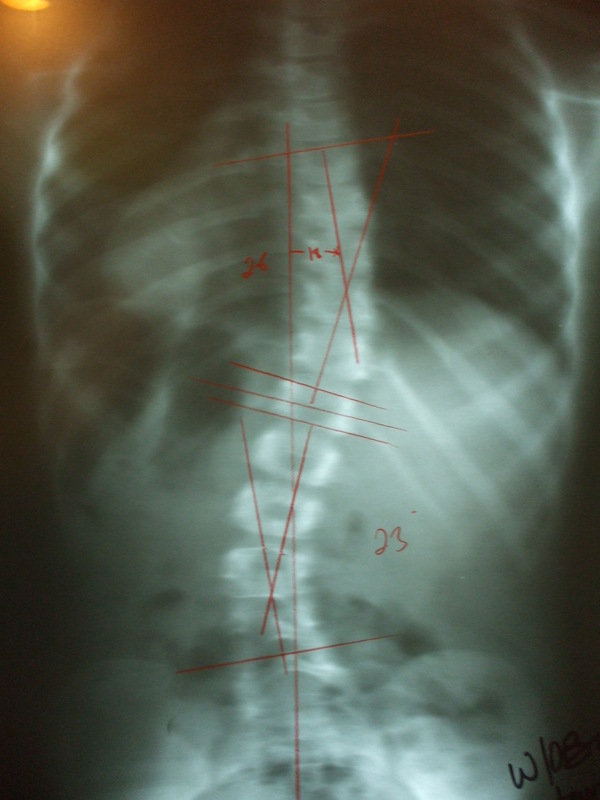 Scoliosis patients just need to travel to get the best sometimes. And, one thing I can personally attest to is that Dr. Morningstar, his wife Dr. Strauchman (who I also highly recommend, but that’s for another post), and his entire staff, truly care about patients. And, I feel that the quality of a caring professional may SEEM like just icing on the cake, but can really be the driving force behind great products. Dr. Morningstar fitting V. for his Tornado suit.